You know that not everyone can install an expensive water filter for their home, or they just don’t want a large filter system for some reasons. No matter where you live, tap water is sure to contain a number of contaminants. Faucet mount water filters give easy access to clean and safe water from the comfort of your house. What Is A Faucet Mount Water Filter? A faucet mount water filter is a small point of use water filter that attaches directly to your tap. It removes several water contaminants, ensuring water is safe for drinking, cooking and cleaning. Faucet mount water filters mainly rely on activated charcoal filters and are easy to install. How Does A Faucet Mount Filter Work? Faucet mount water filters enhance the taste and smell of water by flowing it through a series of layers. First, there is a filter screen that safeguards the filter system and traps large pollutants such as rust, sand and debris. Then, most models use chemical filtration to absorb contaminants, often through an activated carbon filtration stage. The activated carbon is porous and attracts contaminants as water flows through it. This requires a little amount of time, hence a noticeably reduced flow rate when using a faucet mount water filter. Who Will Need A Faucet Mount Water Filter? Faucet mount water filters are a great solution for renters who cannot install a permanent whole house filtration system in their homes. You can always carry it with you and it does not make permanent changes to your water system. If you spend lots of time outdoors, a faucet mount water filter can be beneficial. It is easily portable and lets you access clean, safe water for cooking and drinking from any source. Faucet mount water filters are ideal for those looking for an easy to maintain and install water filtration system. They do not require any plumbing systems and can be installed by anyone. Additionally, they are cost-effective compares to reverse osmosis or whole house filtration systems. Most reputable brands offer faucet mount water filters that actually work and provides clean, safe water at home. We have rounded up a list of top 14 best faucet mount water filters with detailed reviews (include pros & cons). This review and buying guide gives you better insight when looking for the best faucet mount water filter. The Brita on tap water faucet filter is an effective clean drinking water solution for an average sized household. It is a small, affordable unit that makes your water taste extremely fresh and crisp. It removes water pollutants such as heavy metals and chlorine. Its multistage filters can eliminate sediments and small particles in the water. The Brita on Tap Water Faucet Filtration System filters more than sixty water pollutants including 99% lead, chloramines, asbestos and disease causing microorganisms. It reduces lime scale and comes with a water hardness testing strip that you can use to measure your tap water’s level of hardness. This faucet can only be used with standard faucets and are easy to set up. It does not require special tools or knowledge but it does not fit spray or pull-out style faucets. There are 2 filter cartridges on this unit that can filter up to 100 gallons of clean water. The filters are replaceable with a light indicator. This will notify you when it is time to change the filters, usually after around 4 months of use. It has an on and off filtering switch that lets you switch to filtered or unfiltered water, depending on your needs. There is also an unfiltered water spay option. It comes in two colors; white and chrome. They are flawlessly designed to easily match your kitchen décor without taking much space. Does not fit style faucets. LED indicator reported to malfunction after a while. The Brita 35214 is reliable for safe drinking water and leaves water with a great, distinct taste. It makes water healthier by eliminating 98.5% lead and other water contaminants that may be harmful to your health. This includes chlorine, benzene and sediments. This filtration unit fits all standard faucets and is easy to install. It requires no tools for installation and has a switch that lets you conveniently toggle between filtered and unfiltered water. The Brita 35214 has a two-stage filter and an LED indicator that reminds you when it’s time to replace your cartridges. It is NSF certified and built to last. Has an added filter layer for trapping sediments. Has a high flow rate. Brita does not provide filtration information for this unit. Access to clean drinking water has been made easier with the Brita Chrome Faucet Filtration System. Once it is set up, you only need to flip a switch and you have clean, healthy water. It does not take up much space, which is convenient and has a moveable tap that you can swivel to create more space in the sink. This filter is made from BPA free materials and can remove bad smells and contaminants found in tap water. It is certified to remove 99% lead, chlorine and other water contaminants. There are three filter modes; unfiltered spray, filtered and unfiltered water options. The filtered spray option is more messy with the latter two having a finer flow but at a reduced flow rate. It comes with its own installation hardware that can fit all faucets except pull-out faucets. Set- up is easy and will take the least handy person less than five minutes. It can filter 100 gallons of water before you need a replacement filter. This is a cheap way to ensure you have clean water as this capacity is equal to an average of 750, 16 oz. bottles of water. Its chrome finish matches most modern kitchen décor. Buyers reported leakages over time. 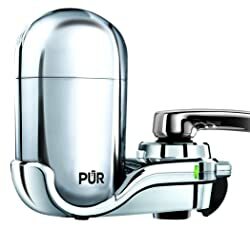 The PUR FM-3700 is a superior quality faucet water filter that provides a clean and healthy water supply. It is effective for eliminating over 70 contaminants and has proven to remove up to 99% lead, 96% mercury and 92% of pesticides in tap water. It is a hassle free solution to clean water as compared to pitchers that would need constant refilling. The PUR advanced faucet water filter is easy to install. It comes with 4 adapters and fits on most standard sized faucets. There is a bright LED indicator that comes on when it is properly installed and ready for use. This filter provides your household with over 100 gallons that lasts approximately three months. This not only gives you peace of mind but is cost effective than bottled water. MineralClear filter is a premium technology installed in this unit for excellent performance and reliable filtration. It combines activated carbon and ion exchange filters to eliminate as many contaminants as possible. It has a 360° swivel that fits most sinks and an on and off switch that lets you switch between filtered or unfiltered water. Drastically improves taste of water. Metallic finish fits most kitchen decor. The filter body is constructed from cheap plastic. Can only be used with cold water. Tap water may look safe but contain hundreds of contaminants hidden from the naked eye. The PUR 3-Stage Horizontal Water Filtration Faucet Mount is a compact water filter that ensures you have constant access to clean water. Unlike other complicated filtration systems, this is really easy to install. It comes with ‘one-click technology’, where you attach it directly to your faucet while holding down a set of buttons, and it is ready for use. It is NSF-401-certified. This means that it can remove pathogens and over 90% of chemical pollutants such as herbicides. The filter has an LED light indicator that will notify you when it is time for a filter replacement. Improves color, smell and taste of water. Housing is made of plastic with a metallic finish. The diverter valve is susceptible to scale build up. This PUR water filter guarantees safe and healthy drinking water straight from your tap. It is built with cutting edge technology that can filter out water contaminants through two-stage filters. It has a capacity of 100 gallons, which lasts an average household about three months. PUR’s Basic filter combines carbon and ion exchange materials to absorb over 70 contaminants. It is certified to eliminate 99% lead, 92% pesticides and 96% mercury. A CleanSensor Monitor indicates the state of your filter so you know when to replace it. It is compatible with standard faucets and comes inclusive of three back up adapters. This makes it convenient and easy to install. Reported dripping after water is shut off. This lovely chrome finish filter is an appealing and compact water filtration solution. The Culligan FM-25 filter does the job like a pro but is really simple to use. It can get rid of odors and toxins such as chlorine, atrazine, giardia cysts and lead. This unit has three levels of advanced filtration for quality filtered water that is odorless and tastes delicious. It uses a carbon block filtration system that is NSF certified for lead removal. However, it does not reduce other organic water contaminants. On average, you will get about 200 gallons of water before you need to replace the filter. It does not come with a light indicator that shows when it is time to replace the filter. Having a spare one at hand is always advisable as this lasts only 2 months. The Culligan FM-25 comes with adapters that fit any standard faucet and has a simple diverter that automatically switches from filtered water to regular tap water. Filter compartment may not last as long as indicated. Filtering your water ensures you have clean and healthy water to drink and use. Using a faucet mount water filter is an easy and convenient way to get a clean water supply that is steady. The Culligan FM-15A reduces bad taste and odors and other contaminants such as lead, sediment, chlorine and atrazine. It has a diverter tab that lets you switch from filtered to unfiltered water whenever necessary, for example, you may use filtered water to drink and tap water to wash dishes. The water pressure is at 6O psi and has a flow rate of 0.5 gallons per minute. The FM-15RA filter cartridge has a lifespan of two months or 200 gallons and is NSF certified against standard 42 and 53. It uses a solid carbon filter to remove impurities that affect the taste and quality of your tap water. This unit comes with an adaptor that fits most aerated faucets. Its stylish design comes in a chrome or white finishing that is aesthetically pleasing and easily matches most kitchen décor. It comes with a cartridge replacement sticker that will let you know when you need to replace your filter next. Filter cartridges are cheap to replace. Has a toggle from filtered to unfiltered water. Can be hard to separate filter from housing units. Has a fragile plastic adapter. This is an efficient water filter that uses activated carbon fiber to filter out contaminants and make water safe for consumption. It removes foul odors such chlorine, improves the taste of tap water and eliminates harmful pollutants such as lead, light sediment and particulate class 1. The Culligan FM-100’s filter cartridge is easily replaceable and can last up to 2 months. This is approximately 200 gallons of clean, healthy water at a flow rate of 5 gallons per minute. The filter has a light indicator that will flash red when it needs to be replaced. This is powered by a battery and is a convenient reminder beforehand. It uses a 55/64-27 female metal collar and 15/16-27 male adapter that fit most aerator faucets. It is compact in design and easy to install with no tools required. Simply pull on the diverter tab to automatically switch from filtered to unfiltered water. The on/off control button malfunctions after short term use. This Waterdrop faucet filter system is a high quality 5-stage filtration system that provides clean and safe water for your family. It has a 320 gallon capacity and effectively removes toxins from your water. It reduces lead, fluoride and other water pollutants, leaving your water with a fresh, crisp taste. For a budget filter system, the Waterdrop WD-FC-01 does an excellent job. It has preliminary and end-filtration stainless steel meshes that filters large sediments and filtration layers that eliminate lead, rust and other small particulate matters. The Activated Carbon Fiber (ACF) filtration stage has a high absorption capacity and is certified to reduce bad odors and 93% of chlorine in tap water. This filter system is one of the most cost effective units you can buy. The filters last up to six months, three times longer than other faucet filters and is equivalent to 2,000 16 oz. water bottles. Waterdrop WD-FC-01 is convenient to use with a number of nifty features. It has leak proof technology and fits all standard faucets. It has a high flow rate and lets you switch between filtered and tap water by simply pulling on a lever. Fast and airy water flow. Does not have a light indicator. DuPont offer a water filter system that works without a glitch and is stress-free. It is an electric-metered system that is easy to install and can filter up to 200 gallons of tap water. It purifies tap water and improves its taste and smell. The filters on the DuPont – WFFM350XW remove most water contaminants and is certified to reduce cysts, sediment, chlorine, mercury, lead and other heavy metals. This improves the clarity and quality of your tap water and also ensures you keep your family safe from waterborne diseases. One of its unique features is the LCD display that shows the amount of water that has been filtered. This is an accurate way to know when your filter needs to be replaced. The DuPont faucet mount water filter fits most standard faucets and is easy to install. This system has antimicrobial product protection which lengthens the housing and media lifespan. There is a variety of colors to choose from; chrome, brushed nickel and white. Gives the water a distinct neutral taste. LCD may display wrong reading. The Engdenton faucet mount water filter combines excellent functionality with great ease of use. It is made from stainless steel material that is durable and leak-proof. This is one of the most efficient filters available with a capacity of 320 gallons. It can swivel 360° at any angle, making it convenient for a small size kitchen sink. The Activated Carbon Fiber filtration media on this unit is sourced from Japan and can guarantee 0.5um filtration accuracy. It is antibacterial and removes water contaminants such as sand and rust to make water healthier for you and your family. The stainless steel housing of the Engdenton water filter gives it a cutting edge over most other brands. It is high quality food-grade 304 stainless steel that is durable and leak proof. Has a high flow rate of approximately 3 liters a minute and fits any standard sized faucet. You can change from filtered water to tap water with just the flick of a switch. The 360° swivel at any angle. Does not remove Totally Dissolved Solids (TDS). Engdenton Company does not provide filtration details. Safe drinking water is essential for a healthy life. Tap water has several water toxins that make it harmful while bottled water offers a safe but costly option. The Stratomax faucet water filter is an effective solution for an average sized family. It reduces over 70 toxins found in your tap water using a complex filtration system that is efficient and easy to use. The Stratomax water filter uses a diatomite ceramic filter that generally performs better than plastic filters. It has an 8 layer high filtration system with an accuracy of 0.1um that effectively removes impurities such as sediment, scale, rust and other water toxins. This unit is made from food-grade quality, galvanized plastic that is durable and less susceptible to leakages. It has a compact design and fits directly to your faucet, making installation easy and quick. Removes chlorine smell and taste. Of all the faucet mount filters reviewed above, the PowMax filter has the largest capacity at 400 gallons. It is easy to mount and is efficient for turning murky tap water into clean and pure water that is safe for drinking. It is certified to eliminate over 70 contaminants including 96% mercury, 99% lead and 92% pesticides. The filter cartridges can last up to three months and are made from biodegradable plastic. The PowMax ww-43 filter has an indicator that lets you know when to replace the filter cartridges. Additionally, it has a 360° swivel that fits any sink. Replacement cartridges are cheap and easy to mount. Most faucet mount water filters work in the same way though they are built differently. To find one that works for you, there are a few things to consider and below are a few to get you started. Filter cartridges are the biggest consideration before you purchase a faucet mount water filtration system. They remove water contaminants from water and can eliminate more than 70 pollutants, depending on the brand. Once you test your tap water, look for a filter unit that removes most of the contaminants you find. It may be impossible to find one that is 100% efficient, but most will get the contaminants below EPA standard limits. Faucet water filters are generally small compared to other water filters. The size and design of your filter will determine how much space it will occupy. In case you have a small sink, a bulky unit would be hard to maneuver especially when cleaning dishes. Size is directly proportional to the capacity of your faucet mount filter. Most range from 100 to 300 gallons, a feature to take note of when buying for a large family. When choosing the right water filter, consider how long it will last and its fit in the kitchen. Filters with stainless steel housing are usually favored over plastic ones as they last longer and are aesthetically pleasant. There are faucets that can rotate around their horizontal and vertical axis. This style is convenient for unhindered use of your kitchen sink when you need the space. Faucet mount water filters are easy to install and do not require the services of a plumber. They connect directly to your faucet and comes with installation hardware if needed. An easy to install water filtration system is reliable in case you need to move it or change the filter cartridges. Faucet mount water filtration is one of the most affordable ways to have clean, fresh water. When considering your budget, it is important to factor in added costs such as cost of replacement filters and the filter’s lifespan. There is something for everyone in the market and compared to bottled water, faucet mount water filters are a steal. A filter change indicator notifies when you need to replace the filter cartridge. This could be a light indicator that changes color or one that counts days since the last filter change. Either one is a convenient feature to ensure you do not run out of clean water unexpectedly. Faucet mount water filters are available and easy to install. They can transform your life by maintaining a reliable source of clean water for drinking, brewing beverages and other household purposes. All of the ones listed above are of superior quality and will guarantee safe and healthy drinking water for you and your family.